A “mini” term of jewellery workshops of two different types: either for complete beginners or for intermediate / returning students who need a bit more time in the workshop to complete existing projects. 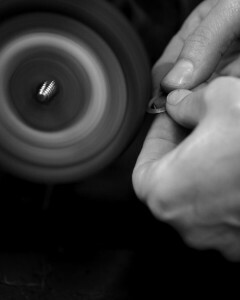 The beginner course covers two projects – either a Ring or Bangle in the first two lessons, then Pendant, Earrings or Cufflinks in lessons three and four. The course take place at Rachel Jeffrey’s workshop at 2a Mill Walk, Wheathampstead, AL4 8DT, next door to the Rachel Jeffrey shop. One four week course £100.00 (all tools are provided, however material costs are additional). Please note places can only be secured once payment has been received – payment can be made by card over the phone, by visiting the shop, or via BACS.